Nearly 350 homeowners stand to lose part of their gardens under plans to build 230km of dedicated bus lanes across the city. 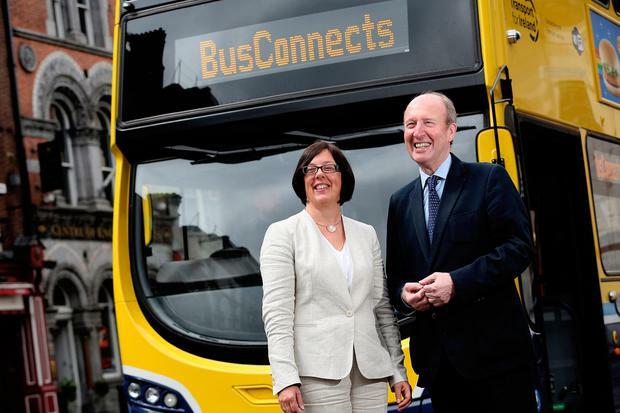 The National Transport Authority (NTA) has written to 345 households in Clongriffin, Swords, Blanchardstown and Lucan to warn them their property could be needed for the BusConnects scheme. Face-to-face meetings have been sought by transport bosses to explain the plans, which involve a €2bn redesign of the capital's bus system undertaken by US-based consultant Jarrett Walker. The project is aimed at giving buses 230km of dedicated road space without cars, which will speed up journey times, as well as 200km of cycle routes. If implemented, it will reduce journey times on some corridors by up to 50pc. However, it will result in homeowners losing part of their gardens to allow roads to be widened to accommodate the new infrastructure, including footpaths. In addition, a total of 232 car parking spaces will be lost on these four corridors and 514 trees removed. In all, 16 routes are proposed. Households on four routes have been advised by the NTA that their properties may be required, with affected homeowners on the other 12 to be told in the new year. While no household will lose all of its garden, between one and four metres of the property may be required. The first corridor runs from Clongriffin to the city centre. In all, 120 properties may be affected, with 100 trees to be removed and 31 car parking spaces sacrificed. A total of 10km of bus and 6km of cycle corridor will be provided. The NTA said the current bus journey time is up to 65 minutes, which is projected to fall to 30 to 35 minutes. • Swords to city centre: 110 properties may be affected, with 12km each of bus and cycle corridor planned. A total of 101 car parking spaces may be lost and 170 trees. Current journey times, which can take up to 71 minutes, will fall to 40 under the plans. • Blanchards-town to city centre: this will impact on up to 100 properties, 87 car parking spaces and 200 trees. A total of 8km each of bus and cycle corridor is proposed, with journey times projected to fall from up to 65 minutes at present to 25 to 30 minutes. • Lucan to city centre: some 15 properties to be affected, with the loss of 13 car parking spaces and 44 trees. In all, 10km of bus and 5km of cycle lanes to be built. Current bus journeys take up to 50 minutes, which will fall to 30 to 35 minutes. The NTA has written to affected households, seeking one-to-one meetings. Sources said no household would lose its entire garden, and they would be paid compensation based on the market value of their land. In addition, their garden will be landscaped. "We do wish to reiterate that these are proposals only which are not fixed or finalised," the NTA letter says, adding that the scheme will be subject to a full public consultation process. The NTA said the scheme is subject to planning consent from An Bord Pleanala. If approved, the four routes will result in 40km of dedicated bus corridor being built, as well as 31km of cycle paths. Journey times are projected to fall by as much as half on some of the corridors if the changes are approved. However, if no action is taken, they are projected to increase by a minimum of 10 and more than 20 minutes in some cases. The trip from Clongriffin to the city centre could increase from up to 65 minutes to more than 85, while that from Swords will rise from up to 71 minutes to more than 80. Blanchardstown to the city centre could take more than 80 minutes, up from 65 minutes at present, while Lucan to the city centre will increase from up to 50 minutes to more than an hour. The NTA said 57 bus routes run along the four corridors. More than 60 million passenger journeys are made each year. The letter outlines how congestion is a "major problem" in the city and that on the busiest routes into the centre, bus lanes are only in place for less than one third of the corridor. "This means that for most of the journey, buses are competing for space with general traffic and so are also affected by the increasing levels of congestion", it says. It adds that the "emerging preferred" route "may" impact on part of the householders' property, with detailed plans showing on-street impacts available from today.